Have you ever wondered how a person becomes a "Power Performer" and lives an exceptional life? Do you know people who seem to lead a charmed life? Nothing ever seems difficult or complicated for them. They get straight As in school. They move into a fast-track career and advance swiftly. They effortlessly find a perfect mate to share their lives, and then raise a family of wonderful, talented children. If they agonize over anything, it sure doesn't show. How is it that some people seem to get so much more out of life, while others must put forth a great effort just to get by? It's no accident that certain individuals excel, while others merely exist. Now Roger Dawson, author of the top-selling programs The Secrets of Power Negotiating, Confident Decision Making, and The Secrets of Power Persuasion brings his sharp insights and strong ideas to personal performance and life itself. Dawson, in his ever-present style of grace and wit, takes the next logical step from negotiating skills and persuasion techniques to explain lifestyle philosophy and overall performance principles. If you've learned and benefited from Roger's previous three programs, you simply cannot miss this program that reveals more of the Roger Dawson you've come to appreciate than ever before! (And if you haven't experienced Roger's unusual approach to skill building and attitude, there's no better time to start than right now!) The potential for power performance is in all of us! Releasing this untapped energy can set you on the road to understanding The Secrets of Power Performance. When you are facing down those kind of odds, you'd better know exactly what you are doing before you take the plunge. Success lies in the system! Gerber knows that for a business to be prosperous it must function like a powerful machine. The type of business is irrelevant - a precise system of dynamic interplay between the connected parts should be in place. The well-planned system will, once started, chug along continually and predictably, transporting you to the better life of which you've only dreamed. After all, your business should make it possible for you to do whatever you wish, whenever you wish, while continuing to produce exceptional results... without you! That is your fundamental goal - dispensability! Many sales books are either very heavy on theory or just straight to tips and tricks. This one has an excellent balance of understanding the reasoning behind the approach along with specific ways to execute it, real life examples, and counter gambits. It's presented as a game, but with the ultimate goal of both sides winning. many useful techniques and methods in negotiation. only thing is that it is in American context so have to modify and chose carefully in other region of the world. This is my first review on Audible. This book taught me a lot about negotiation. I am new to negotiating, this book is a must! Good negotiating tips and sales training refresher... although maybe a little dated, but what book isn't? I listened to this book back to back and will probably listen to it once again... as I've started to do this with all my books to better absorb the material. this book has good tactics and negotiating concepts and styles. It teaches you about different perspectives of negotiations. Great book well worth the money! I like Roger Dawson practical approach. 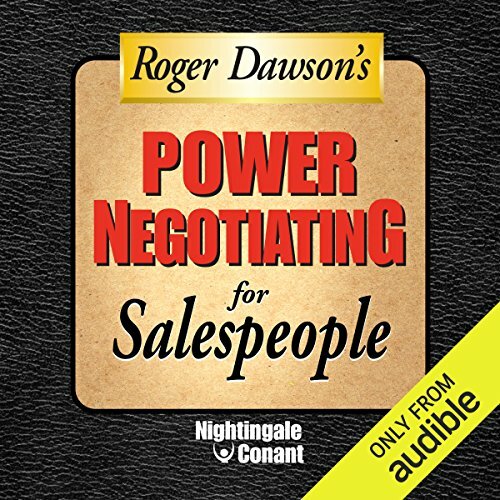 Even many parts of this audio books similar to the main one secret of power negotiation, it still add valuable insights about the psychology of negotiation for sales people. Another great work from Roger.